Have you ever hated a co-worker or boss so much that the mere thought of the person, even a decade or more later, could set your blood boiling? Three people in my life earned that dubious honor. Each one left a scar on some section of my early career, back when I was a cocksure, supposedly brilliant young professional. Since I couldn't envision a future in which I was not in charge, I took great pleasure in burning my bridges with these executive miscreants. Looking back, I'm certain that I deserved everything they dished out. Yet, I still loathe them, and I'm sure the feeling is more than mutual. Although I haven't seen any of them since I torched our ties, I know that I will eventually, because this is Boston, a big small town. It's even smaller if you work in one of the insular little industries that make up Boston's economy - industries in which you cannot move, eat, sleep, burp, or transgress without everyone knowing about it. More important, in Boston, it seems as if no one ever really leaves. It's like a sprawling, cobblestoned Hotel California. A person might fade from view for a while, but one day he will likely reappear in your professional life, often in a position of authority. And if you have tussled with him in the past, he will appear on your career path like a big, spiteful speed bump. 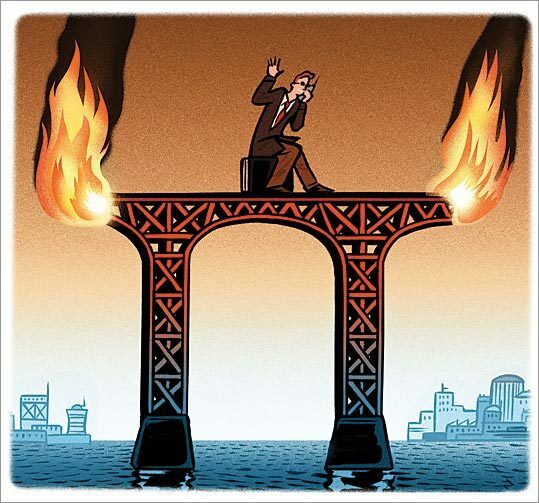 Lashing out at someone you feel has done you wrong, burning a professional bridge, feels good - for a minute. It's a way of asserting your power in a situation in which you feel powerless or overwhelmed. Walking away from a job that you hate without a word to anyone, telling off a co-worker, client, or boss, or purposely scuttling a project by failing to deliver your end are just some of the ways that you can let the hated individual know exactly who is in charge - principally when you're not. But as good as it feels, we underestimate the devastating long-term effect such instant gratification can have on a career, especially when we are just starting out. As a longtime member of the journalism brotherhood, I've seen this firsthand far too often, especially among each year's new crop of supposedly brilliant young people who can't envision a future in which they are not in charge. Like the young me, many of those new to the workplace (and sometimes even those who have been around long enough to know better) are sure they'll one day be boss, so it does not matter who they alien- ate. What they don't consider is that all but the biggest bosses have a boss, and the biggest bosses have employees. No matter what professional heights you hit, a person you've alienated in the past can do a whole lot of damage - from above or below. Some might equate doing nothing with surrender or being conflict-averse. That isn't the case. It takes confidence to let the idiots pass by without grabbing their bait. It re- quires a deep and profound maturity to place your long-term career goals above the thrill of telling an office bully exactly where to get off or spitting in his mocha latte. It's an insight I wish I'd had back when it would have done me some good. Because in the Boston workplace, whether you're the mayor or a coffee-fetching assistant to another assistant, whatever goes around comes around. And I, for one, am bracing myself for those speed bumps. Kris Frieswick is a frequent contributor to the Globe Magazine. Send comments to magazine@globe.com.